On this Thursday, 18th of April, the event UX Tartu will take place for the third time already! UX Tartu is a part of sTARTUp Day’s official side event series sTARTUp Talks. One of the speakers at UX Tartu is going to be Cleveron’s UI/UX Designer Allan Triik, who together with Cleveron’s Head Designer Lauri Hirvesaar shared his thoughts about Cleveron’s vision and the importance of good user experience. Bronze medal at Edison Awards for innovative ideas, the title of Estonian Entrepreneur of the Year and Estonian Enterprise of the Year. Collaboration with the biggest brands in the world, such as Zara and Walmart. Starting a robotics academy in a small town called Viljandi, creating a technological higher education curriculum in robotics software development and providing scholarships for the students enrolled in the academy – sounds absolutely surreal, huh? This amazing list of achievements is a reality for the Estonian company called Cleveron. Founded in 2007, Cleveron has created a whole new direction for the field of logistics with its innovative parcel delivery robots. When it comes to Cleveron’s innovative ideas one could say the future is now! Today, their original idea has grown into something so much bigger – they’ve developed products such as a robotic parcel terminal, extendable parcel terminal, and an autonomous robot courier. And let’s not forget about personal parcel lockers, which will be placed outside one’s house and eliminate the need to wait at home for the courier. What were the main UX related challenges during the process of designing your robot? 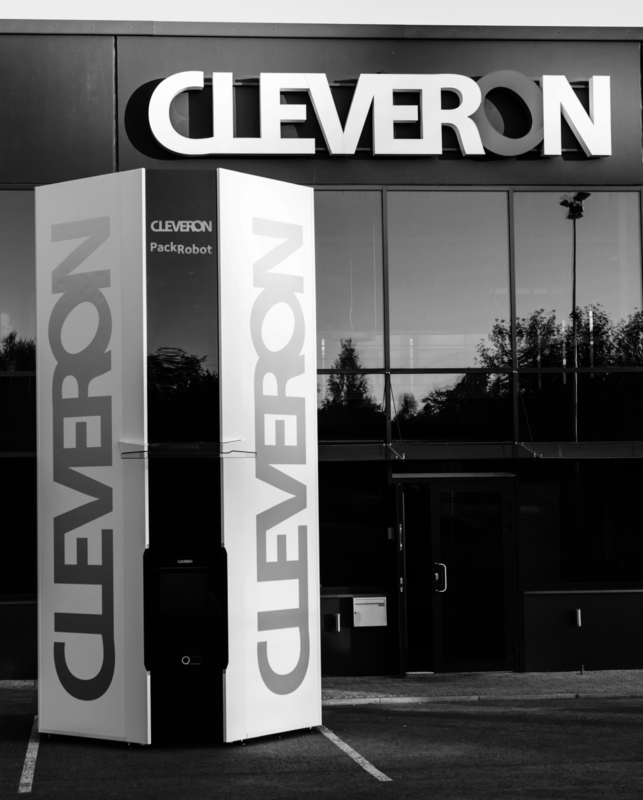 Since Cleveron’s robotic parcel terminal was a fresh and innovative approach to handing over packages, the whole process was a major challenge. We had to start from zero to come up with technological solutions that would work. To actually make the technology run smoothly, we had to write new software for it and simultaneously make the product interact with the user. One of the biggest challenges was connecting with the user and explaining this new machine to them. We are definitely planning to bring packages even closer to users with our ideas and see a big potential in the field of online shopping and delivery of groceries. At that moment, most of the users were already acquainted with traditional automated parcel lockers, so our new robotic „parcel tower“ with only one door did not associate at all with receiving or sending packages. While we were testing prototypes, it was a very recurring occasion that after entering the package code on the screen, people tried to search for an open door somewhere on the machine, although at the same time the packages were arriving where the screen was. Solving these kinds of questions was difficult, but an excellent learning opportunity. Which direction are you planning to take with your technology development? We definitely want to remain as leaders in our field, which is why we constantly test out new technologies that can help us with our main goal – to save time for our product users. We monitor the trends in e-commerce as well as in parcel logistics as a whole and try to create products to match these trends. We are planning to bring packages even closer to users with our ideas and see a big potential in the field of online grocery shopping and delivery. How does one stand out with its product these days? In your opinion, what product-based value is the most important for users? To stand out, we have decided to stay one step ahead of our competitors and to come out with new solutions before anyone else does. This is one of the few effective ways to stand out and make a name for yourself. We have also aligned our product development with our main goal, which is to save people time. We have followed this principle when creating our existing products and developing new ideas. UX has grown to be one of the most important values a company can offer and a way to measure quality. Why should a company pay attention to UX? At what point during your development process did you feel like UX is very important regarding your product? UX has grown to be one of the most important company values and marks of quality. As a result of the pace of life becoming faster, people have grown to value convenience and time has become an important asset and resource. With that, the willingness to spend time on unnecessary tasks is decreasing. This is why companies should value UX because it is a part of a company’s reputation as well as being an important selling point. User experience has always been a top priority for Cleveron because Cleveron was born out of an idea and a need to create a time-saving user experience. Is UX design going to save the world? If we save people enough time through good user experience, they will perhaps have enough time left in a day to deal with saving the world. You can hear Cleveron’s UX designer Allan Triik give a talk on 18th of April at sTARTUp Day’s official side event series sTARTUp Talks’ event UX Tartu 2019.